The toaster bags can be able to use in Toaster, Microwave, Oven, or on a Grill. You can use it to make a large number of toasted sandwiches or heat up pastries, pizza slices and chicken nuggets, etc. It is good helper for your life, keeping you enjoy healthy foods! What do you think of it? Hope you enjoy it. Thank you for your time. Wish you and you family have a happy life every day. Made of fiberglass and food grade Teflon with 100% Non Stick surface on both sides, PFOA free and FDA approved, healthy and safe. Bags make it easy to heat up your favorite foods while keeping you kitchen appliances clean and crumb free. Perfect for food allergies, helps gluten free diet. Toaster bags are reusable and can be washed in warm soapy water or in the dishwasher. Can be used up to 50 to 100 times. Convenient for you to take your toaster bags with you to keep your food clean on public grills when you travelling. [QUALITY MATERIAL]: Made of fiberglass and food grade Teflon with 100% Non Stick surface on both sides, non-toxic and tasteless. Our product is BPA free, PFOA free and FDA approved, healthy and safe. Heat resistant up to 500°F or 260°C. [CLEAN & HEALTHY]: Using toaster bags significantly reduces time of cleaning your kitchen appliances. Prevents food cross contamination and reduces chances of allergic reactions. Toaster bags are perfect for your gluten free diet. [WIDE APPLICATION]: Being able to use in Toaster, Microwave, Oven, or on a Grill. Allows you to quickly heat up your favorite snack, pizza, grilled cheese sandwiches, chicken nuggets and sausages, etc. [CONVENIENT & REUSABLE ]: Convenient for you to take your toaster bags with you to keep your food clean on public grills when you travelling. 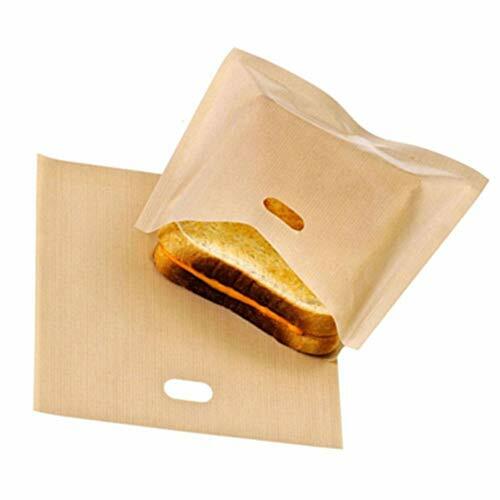 The toaster bags can be used up to 50 to 100 times. [SATISFACTION GUARANTEED]: Our business philosophy is based on quality both in products and in services. If you are not completely satisfied with this product, just let us know and you will be offered a full refund or replacement.